We aren’t going to do a full Inside The Playbook breakdown here because it doesn’t really warrant it; however, there’s a play from Virginia’s demolition of Morgan State worth highlighting. As we’ve discussed in this space before, Kyle Guy is an exception off-ball player on offense. A big facet of UVA’s half-court offense is to feature Guy zipping or curling off pindown screens — or spacing out after a flare screen. Guy is a master of reading defenders and the necessary footwork needed to create separation. In the 2017-18 season, Guy shot 44.8 percent (56.1 eFG%) and scored 1.08 points per possession coming off of screens, according to Synergy Sports.. The 194 points he scored an off-screen possessions ranked fourth nationally. Those number are a little down to start the season — 0.95 points per possession (48.4 eFG%) — but still pretty darn good. At ACC Media Day, I asked Guy: who is the best screen-setter on Virginia’s roster? He quickly responded by gesturing to the man who was sitting next to him at the time: Jack Salt. It’s obvious to see why that’s the case; if Salt went a whole game without touching the ball, and just ran around setting screens, he’d probably be totally content. This season, Salt’s usage rate has ticked up slightly — 14.9 percent, according to KenPom — and he’s shooting 56 percent on two-point attempts. However, he doesn’t draw a ton of gravity as he slips or dives to the hoop. That works to Virginia’s benefit at times — Salt will roll easily in for a slam. But it’s huge to have another guy on the roster that can screen and also offers serious offensive potential after the pick. This is where De’Andre Hunter enters the picture. Hunter is a beast in transition and on the offensive glass (70 FG% on put-backs, per Synergy); plus, his face-up game is an offense to itself, at this point. He continues to get better and better as a catch-and-shoot player, too, which opens up other options. He’s shooting just under 48 percent from downtown (3.7 3PA per 40 minutes). According to Synergy, he’s 9-of-19 on catch-and-shoot attempts (68.4 eFG%) in the half court. Hunter is also 3-of-4 (87.5 eFG%) on pick-and-pops this season, too, which brings us back to the Morgan State game. Early in the first half, Virginia’s starting five is in its usually half-court mover-blocker setup — with the shot clock half expired. Initially, it looks like Guy — in some floppy action — will run to the right side of the floor for a double screen from Kihei Clark and Salt. Instead, however, he rejects the double, jabs and flies off the pindown from Hunter. Guy’s defender does a nice job fighting through the screen, but with the side of the floor cleared, the 6-foot-3 guard has an angle to attack to his left. Both defenders crash down on Guy (15.9 percent assist rate, a career high), which leaves Hunter wide open for a catch-and-shoot bomb. This type of action with these two dudes will be a bear to guard all season. Opponents will rarely have the personnel to switch; there most be some form of help-and-recover defense. Teams must respect Guy’s jumper, which creates the advantage for Hunter. If he continues to shoot this efficiently from deep, it will force plenty of hard closeouts. 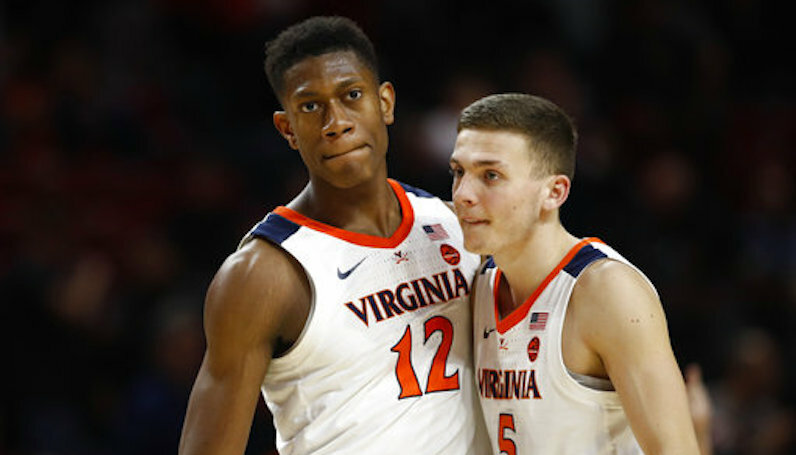 That’s a serious win for Virginia, though; Hunter is an excellent secondary attacker who can beat a closeout and finish at the rim (63.2 FG%). Hunter isn’t a breathtaking passer, but he plays with his head up and can find the open man (5.4 assists per 100 possessions). If he forces extra help, then someone is open for a drop-off dunk or a spot-up three.